Last week I got slammed for supporting Kathleen Folbigg on Mamamia. This week I’m being caned for committing food crimes at Kidspot. Makes me wonder why I work like a navy for diddly squat. This time the commenters are up in arms about me including ingredients such as wheat, rice bran oil and cornflakes in my recipes. Apparently “healthy” is all about coconut oil and butter these days. Who knew? Not me obviously, which is why I should probably take their advice and “learn your information”. Perhaps I could take up a collection and put myself through nutrition school – do you think the news.com.au commenters would chip in a few bucks? 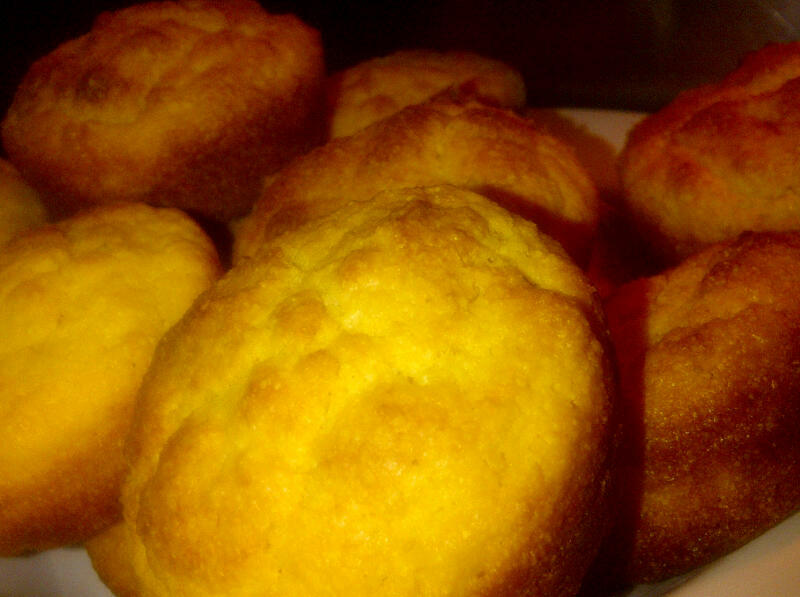 I’m wishing I had a deep-fried ice-cream recipe to blog this arvo to shite them up the wall, but I’ll have to settle for cornbread muffins, filled with evil stuff like sugar and white flour. I served these as part of my go-straight-to-nutritional-hell (and the medical centre) Louisiana dinner party on Sunday night, with oven-fried chicken, coleslaw and mash. Yum. Eat them hot – they’re a bit weird cold – smeared with butter (or if you’d prefer to piss off the news.com.au brigade, use margarine). METHOD: Preheat oven to 180C. Mix cornmeal, flour, sugar and salt together in a bowl. Stir in milk, egg and butter. Mix gently with a wooden spoon. Pour into a greased 12-cup cupcake pan. NOTE TO MY SISTER-IN-LAW: You can make these gluten-free with a cup of cornflour instead of self-raising flour. Hang in there … it seems the whole world feels self-righteous indignation about – well just about everything – at the moment. It also seems to be open season on bloggers. Focus on the positive – you have one reader here enjoying your posts. Maybe next food post could be “junk food buffet” that should really send them over the edge! Thx Shammers can’t wait to hear about the conference. That’s too funny Alana. I’ve spent the last two years being told different things by various health professionals (the yoga/acupuncture/Chinese medicine versus a naturopath) and doing tonnes of reading. Palm oil may be in with some circles, but in most is not. Same with about every food group you can imagine. Eat fresh and not too much processed stuff seems the answer… I enjoy your blogs as I know many others do. Stuff the rest of them! Throw in some extra thick full fat cream and I’m there!!! Sounds like we should have an evil dinner party sometime! Oooh, will seek that out.